So I did a quick google search and realised that I should have been using crushed pineapple. 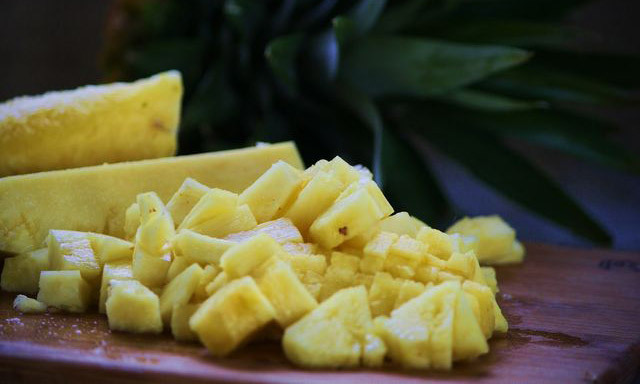 So I picked out each and every piece of pineapple, chucked them in the Thermomix and processed them on turbo a couple of times and voila, I had crushed pineapple �... I know, I said this wasn't the main reason to use pineapple. But it's still kinda true. Replacing a little bit of the oil with the (usually crushed) pineapple does make it a skosh healthier. Or at least that's what I tell myself as I make the cream cheese frosting. 30/11/2016�� Place the pineapple, pineapple juice, coconut milk, Malibu, mint and ice in the jug of a blender and blend until smooth. Pour over the Midori.... 30/11/2016�� Place the pineapple, pineapple juice, coconut milk, Malibu, mint and ice in the jug of a blender and blend until smooth. Pour over the Midori. Pineapple and Pear- Blend/Mash using fork (not completely smooth mixture) Whip double cream till quite thick. Add can of condensed milk to the cream and fold in with spoon how to deal with a crush at work Just use one whole large pineapple - remove the skin and top and bottom, chop the pineapple up (discard the hard centre core) and blend it til it is of a crushed or pureed consistency. Then use it in place of the tinned pineapple. Click the Pineapple Crush Shopkin coloring pages to view printable version or color it online (compatible with iPad and Android tablets). You might also be interested in coloring pages from Shopkins Season 1 category.